FDA approval was based on the on findings from the phase 2 BLAST study. 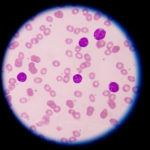 The US Food and Drug Administration (FDA) has approved an expansion of the indications for blinatumomab (Blincyto®) to include the treatment of pediatric and adult patients with B-cell precursor acute lymphoblastic leukemia (ALL) who are in remission but still have minimal residual disease (MRD), according to a news release. MRD is the presence of very low but detectable levels of cancer cells during treatment or posttreatment while the patient is in remission. It is one of the most frequent causes of relapse among patients with solid or hematologic malignancies. The FDA based its approval on findings from the phase 2 BLAST study, for which researchers assigned 86 patients with B-precursor ALL in hematologic complete remission (CR), yet with MRD-positive disease 10-3 or greater, to receive blinatumomab 15 µg/m² daily. Results showed that approximately 80% of patients achieved a complete MRD response rate after 1 cycle of blinatumomab, and reached the primary end point of the study; the median hematologic relapse-free survival was 22.3 months among study patients. The safety profile of blinatumomab remained consistent with those of previous findings; frequently observed adverse events included infections, pyrexia, infusion-related reactions, headache, neutropenia, anemia, febrile neutropenia, and thrombocytopenia. Blinatumomab also carries black box warnings for neurologic toxicities and cytokine release syndrome. FDA approves Blincyto® (blinatumomab) to treat minimal residual disease-positive B-cell precursor acute lymphoblastic leukemia in adults and children [news release]. Thousand Oaks, CA: Amgen; March 29, 2018. https://www.prnewswire.com/news-releases/fda-approves-blincyto-blinatumomab-to-treat-minimal-residual-disease-positive-b-cell-precursor-acute-lymphoblastic-leukemia-in-adults-and-children-300621942.html. Accessed March 30, 2018.